"Carrie was thinking about going to the University of Reno. She and her mother had taken a trip to the location. They were heading back. It was very late in the day. Carrie was driving. They were on the two lane road between and Reno and Las Vegas, about midway between both cities in a very rural area. While driving they observed what looked like blood on the road. It was a tremendous amount and looked as though something had been dragged. Just then they noticed a 4 or 5 foot tall black shadow hunched over off the side of the road. It was about the size of a child but strange looking. Carrie decided to slow down to get a better look at it. The creature then turned around and looked at them. It was “the largest bird I’ve ever seen in my entire life,” Carrie said. The strange "bird-like" creature had red eyes. It had been eating a carcass off the side of the road. Eventually it spread its wings. Carrie claimed that the wing span was larger than her entire car. It took off, flying directly over the vehicle. It was so large that it obscured the entire windshield. The sun was setting so it was silhouetted against that as it flew away. They were quite frightened and about 20 minutes up the road, they managed to find a gas station. They pulled over and got out. They were shocked to find out that they were in Carvers, Nevada. They could not believe it. Carvers was not on the route from Vegas to Reno. Vegas to Reno was a straight line 8 hour drive but somehow they had ended up in central Nevada, in completely the wrong direction from where they were headed. They would have had to have turned off in Reno...but from what they could recall, they hadn't. Even stranger was the they then realized that it was pitch black out. When they saw the bird, the sun was in the process of setting 15 to 20 mins before that but now it complete darkness. They had no memory of it getting dark and didn't know why it got dark so quickly. They checked the clock and found out that it was 10:00 o'clock in the evening. Nearly 4 hours had passed since they last checked. They had no memory of what had happened or how they got where they did. 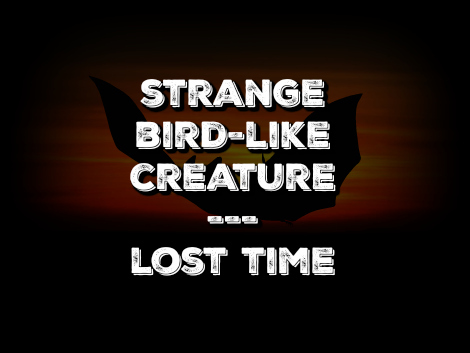 She wondered if the bird-like creature had something to do with their sudden loss of time."